I’m sure you’ve noticed that last month From Pemberley to Milton was stage for several giveaways promoted by very generous authors. I want to thank each and every one of them for being present in my blog and for being so generous to my readers. It’s not just your writing that makes us happy but your constant interactions with your readers, so thank you very much for everything!!! 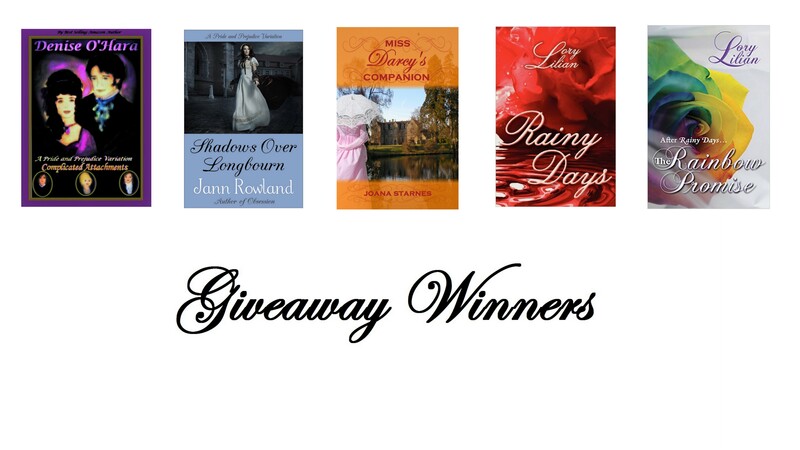 Today I’m announcing the winners for one ebook of Miss Darcy’s Companion by Joana Starnes, one ebook of Shadows Over Longbourn by Jann Rowland, one ebook copy of Rainy Days and another one of The Rainbow Promise by Lory Lilian, and one ebook copy of Complicated Attachments by Denise O’Hara. I announced the winners for Complicated Attachments a couple of weeks ago, but did not receive the contacts of one of the winners, so another winner was randomly selected. I would request all winners to send me their e-mail contacts until the 30th of June so that the books can be sent to you. If in the meantime you have won or bought these specific books, please let me know so that another reader may have a chance to win them. Congratulations everyone!!! Please do not forget to send me your e-mail address to ritaluzdeodato at gmail dot com. Yes, lots of generous giveaways, Rita! Can’t believe I won!!! Yipee!! Thank you so much!!!! Congrats to all the other winners! Enjoy! Hot Dang! I won! I’m a happy girl! Thank you! Oh boy, this is so awesome! Thanks!